It turns out that that six hour goal was a little optimistic. I finished in 7:24:05 with a lot of room for improvement. I learned a lot about running ultras though and that was my real goal for this event. The race started out at a slow pace and seemed surprisingly comfortable to me. I really expected something more like the bike races I'd been in where there's a hard push at the beginning to drop the weaker riders, but I guess that's not the way ultra runners work. I was really confused then when we hit the first uphill and everybody started walking. I'd heard that it was de rigueur to walk anything resembling a hill in ultras, but had always assumed that that only applied to 50 milers and more. A 50k is hardly longer than a marathon and no one walks hills in those. So I ran the hill. Not hard mind you, but at a comfortable pace, and hoped that it wouldn't come to haunt me later. The first lap of the two lap race went really well. The course was extremely hilly. It was like running at Seven Oaks with a few gravel hills like Y-Camp thrown in for good measure. They were steep and long, but so long as I didn't try to run hard I was fine. As it got later in the morning the day started to get very hot. In the woods it was shady, but muggy and still. In the open fields it was breezy, but the direct sun was tough to bear. Still I made sure to run everything and try to keep a moderate pace. I finished the first lap in about 2:45 and thought I might just have a chance at keeping it under six hours, but I doubted it. I had told myself that I'd run everything for the first lap and then see about the second, but though I probably could have run a few more hills I had lost my motivation to do so. I couldn't make myself. I was starting to have a little trouble gettling myself to run the flats and downhills. After about nine miles of that I was starting to fall apart. I needed water, but I hadn't brought a bottle. 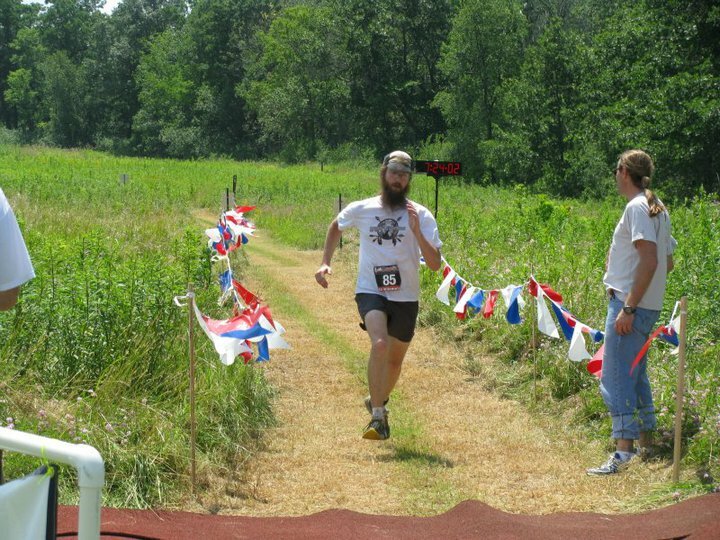 I had figured that I was fine with just the aid stations every three miles or so. After all I often do runs of seven miles without water and I'm fine. With the heat and distance behind me I wasn't as fine as I thought I would be. Added to that I needed a bathroom badly. I knew that there was one in the campground about a mile ahead, but I wasn't sure I'd make it that far, besides it was up a big hill. My calves were also starting to cramp. I figured I'd make the railroad bridge ahead then stretch a little and try to regain some strength for the climb. When I reached the bridge I stopped and started to stretch, but after just a few seconds I felt like I couldn't even stand. I had to sit. I wasn't dizzy or nauseous, just exhausted, I couldn't get myself to move. I sat for a minute to regain some strength. A few runners passed me and asked if I was okay. I said I was and got up to continue. The path circled around beneath the bridge and after just 100 feet or so I had to sit again. I needed water, rest, and a bathroom and wasn't sure which one I needed most. It was only a mile to the next aid station and I knew there were bathrooms at the top of the hill, if I could make it, but I couldn't walk more than a short distance on level ground. I knew I wouldn't make it. A runner stopped and gave me all the water he had left in his bottle, just a mouthfull, and I admitted defeat. I knew that there was a shorter way back to the aid station along a level trail and I decided that was my best choice. I got up and staggered back up to the bridge and the rail trail along the St. Croix river. Then I spotted it. A sign I had missed before that said "restrooms". One of my needs would be met after all. Just a few yards down the rail trail I found them and sat down inside. Immediately I felt better. Maybe I could make it. After a few minutes of sitting I was ready to try again. I walked under the bridge again and up the hill recovering along the way. By the time I was at the top of the hill I could run a little and shortly I was at the aid station gulping down water and HEED. I had figured I would need to lay down for a while, but I felt good to go. How much time was left though? It was 12:30 I had three hours to cover the next five miles, I was going to make it. Running was barely faster than walking, but I'd still run when I could. When climbing hills I'd put my hands on my knees to help push me up (a trick I remember reading about in elementary school, but never understood). Before I knew it I was at the next aid station where John Taylor helped me with water and filled my cap with ice (felt great). All I had left was the "snowshoe loop" which was mostly singletrack and very muggy. I walked almost everything, but forced myself to run the downhills. Finally I passed under the entrance road and knew that there was just one last long hill to go. As I climbed I made up my mind to run the last bit to the finish. Once at the top I started jogging slowly, but steadily until the finish line was in sight. With only 50 yards or so to go I sprinted for it. There was no point in conserving energy any more. I crossed at a run in 7:24:05. Lessons learned: walk the hills, carry some water, and for goodness sake know where the restrooms are. Thanks to everyone who organized and ran the race. It was good to hang out with old friends and meet new ones. Especially John Storkamp, Tim Roe, Angela Hill, Darryl Saari, Dan LaPlante, Karl Neuberger & family, John Taylor, and the blue mohawk guy.